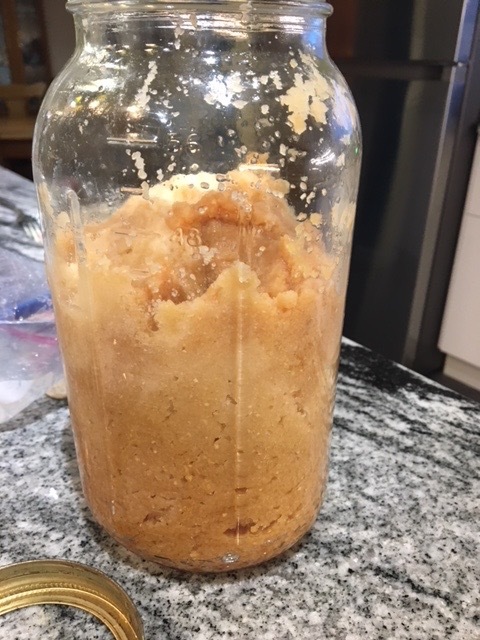 In this section we invite to send pictures of your fermentation questions to kirsten@ferment.works and we will do our best to help you figure out what you are looking at. What Color Should Fermented Garlic Have? My name is Dalton and my fiancé and I have started our journey into the world of fermentation! That being said we started with the simple garlic honey ferment but I’m getting worried about the look the garlic seems to be taking on. I’ve had some of the honey and I tried a garlic clove about 6 days ago and both were very good. But the farther along it gets the more the color is turning grey/dark and to me it looks strange. Is this ok to eat or does it mean the garlic is going rotten and we should start again?! Thanks for any advice you can offer! Nice to hear from you—welcome to the fermentation journey. It is a good one. The color of the garlic will continue to get darker over time and that is perfectly normal. Go ahead and eat and enjoy your honey and your garlic. 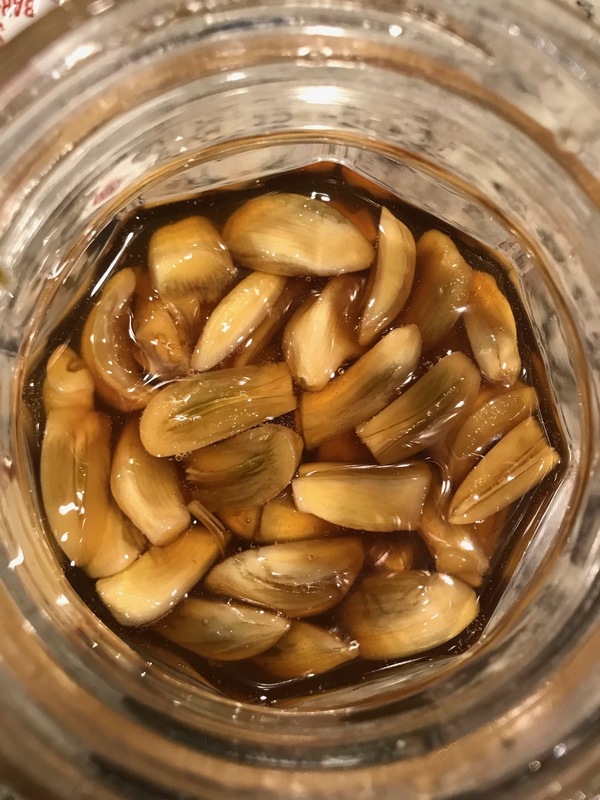 Is Brown Fermented Garlic Paste Normal? I am loving trying all the different ferments from your book, and mostly have had success! This year I had a bumper crop of garlic, and a lot of patience. I Followed the directions for garlic paste. It has been sitting now for 2 weeks, and is starting to turn a brown color. When I took the bag and plastic out, I scooped some out. It smells like garlic! I am worried about the brown. Is this normal? Also on related garlic, is it supposed to kind of turn translucent? I don't worry so much about the liquid ones, I know they are under the brine, and are fine : ). We love that you are enjoying our book. Your garlic paste looks perfect! (Which is good news given that looks like a 1/2 gallon jar—I know how much work went into that?) You can add it to your success list. The browning is the sugars caramelizing and is exactly the color it should be. As far as the translucent — do you mean the ones up high on the side of the jar — those looks discolored. I would always wipe off the lonely stuff on the sides but everything looks pretty perfect to me. The main thing you will want to do is store in smaller containers with little airspace. I have a question about garlic. I started the jar a week ago, and it has been bubbling away. For the last day I notice some of the cloves (I put in whole cloves) are turning a strange blue or green color. I'm totally paranoid because of all the press about Chinese garlic! Is turning colors a sign that it's tainted? Is it normal?? Thanks again for writing the amazing book! I'm so happy to have learned something new! I think every fermentista remembers their first blue garlic. The good news is that our research and experience is that its harmless. If you turn to page 182 in the book you will see the little Fermentista’s Tip on it. The timing of your message is great because Kirsten has a batch of fiery ferments going for the new cookbook and one of them did the blue-green thing on us. We also fermented about 30 lbs of garlic with a farmer friend a week or more ago and all of those are beautiful little creamy orbs like they are supposed to be. So its okay, it will taste fine and be a conversation starter for sure. Lastly, we have noticed over time in the fridge many times (though not always) this blue fades. Let us know how all of your creations turn out Sarah and if you have any more questions.